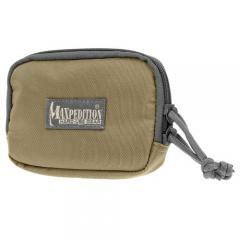 The Hook and Loop Zipper Pocket from Maxpedition is a convenient and versatile modular storage solution for carrying and protecting smaller items. Its full-hook backing allows it to attach to a wide range of compatible tactical gear with loop fields, including vests and larger equipment bags. The pocket's low-profile design ensures it's never in the way once attached to duty gear. The interior contains a slip pocket and an elastic organizer with two divisions, making it easy to keep contents separated and readily accessible. Dual zippers with paracord pulls improve security and retention of contents and allow for quick access when items are needed.